Our steerperson, Christine (who lost her mother to breast cancer) remembered her Robert Davidson inspired, Haida-based tattoo. It was graphically beautiful and represented the spirit of one departed and returned. Being in the Fraser Valley amidst First Nations' culture, the tattoo seemed a suitable starting point. A breast was incorporated and dove-like images emerged from the design. Our logo was born. This is a story about a drum. It is also a story about women, special women. 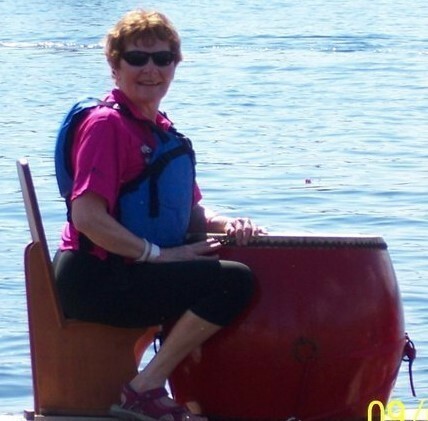 A few years ago, I was asked to join the Spirit Abreast Dragon Boat Team. Unfortunately, I found it too difficult, but I was so impressed by these remarkable women that I felt the need to do something for them. I decided that I wanted to get them a drum. I tried without success several times and kind of put it to the back of my mind. It was not meant to be forgotten, however. When my son-in-law, Ralph, married Donna, the magistrate was Marie Carter, a member of the Metis Nation. Donna and Marie developed a friendship and, one day, Marie said to Donna, "I think I want to make a drum. I have a piece of elk hide that I tried to make myself a drum with, but it kept tearing." Donna told Marie about me and my efforts to find a drum for the Spirit Abreast women. At this point, Marie decided that she would make the drum for me. The day Marie and Donna came to present the drum to me, I was so overwhelmed, I was literally vibrating and could hardly contain my joy. It was then that Marie told me this story. The day the drum was created, there was a double rainbow in the sky with two eagles flying above the rainbows. The native people find this a good omen, for all things in the universe are related. This symbol can be clearly seen on the drum. On one side, there is a darker area of hide on which a very pronounced lighter shaded rainbow is running from one side to the other. When you turn the drum over and hold it to the light, there is the eagle. Incredible! When I told Donna that I wanted her and Marie to be with me when I presented the drum to the members of the Spirit Abreast team, this is what she said: "Vi, Marie and I don't have to be there when you present the drum; we are both just the messengers and our job is done. This is your dream, your drum, and only you need to be there." I could scarcely believe the dignity and selflessness of these two beautiful women and how humble they are. Now, my friends and sisters of the Spirit Abreast team, the drum has been passed to you. This occasion which is bringing so much joy to so many could not have happened had I not become a part of the group of women who are breast cancer survivors. Out of something "not so good" came something "oh, so wonderful" ... a rainbow. We are all women; we are "women helping women." God bless us all.